Prime Minister Benjamin Netanyahu said Wednesday he would be willing to launch direct peace negotiations with the Palestinians without preconditions in order to reach a historic agreement that would end the conflict. 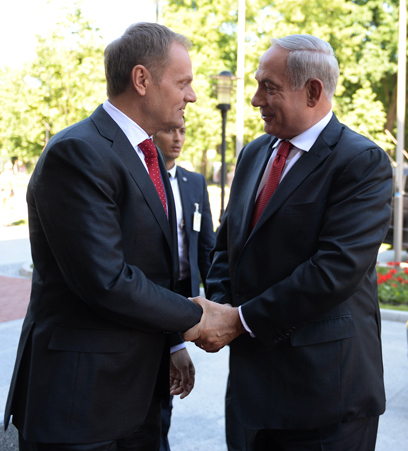 Speaking to reporters in Warsaw alongside Polish Prime Minister Donald Tusk, Netanyahu said the time has come to end the "squabbling over preconditions" and resume negotiations. "Israel is ready for the resumption of direct negotiations for peace without preconditions. I think it is time to stop squabbling over preconditions. I think we have to start peace talks immediately. My goal is to see a historic compromise that ends the conflict between Israelis and Palestinians once and for all," the PM stated. Netanyahu said that such a peace entailed a demilitarized Palestinian state that recognizes Israel as the Jewish state and "ironclad security arrangements for Israel." "I believe that these are the elements for peace. I don't pose them as preconditions for negotiations. I look forward to enter those negotiations without preconditions without delay. I am ready for such a peace. I hope the Palestinians are ready too," Netanyahu declared. Netanyahu kicked off a two-day visit to Poland, which Germany's Nazis occupied during World War II and where they committed the worst crimes ever against the Jewish people, with a stern warning about a potential Holocaust from Iran. The PM told the press conference the upcoming "so-called" Iranian presidential election will "change nothing" in the Islamic republic's quest for nuclear weapons and that the regime will continue to pursue a bomb aimed at destroying Israel. Iran insists its uranium enrichment program has only peaceful goals. Iran's election overseers have approved a list of would-be hopefuls, most of them loyalists favored by both the theocracy and the military, and any future president will likely side with the supreme leadership's nuclear aspirations. "This is a regime that is building nuclear weapons with the expressed purpose to annihilate Israel's 6 million Jews," he said, alluding to the number of Jews killed by the Nazis during World War II. "We will not allow this to happen. We will never allow another Holocaust." Israel considers Iran its greatest threat because of its support of Islamic terror groups, its arsenal of long-range missiles and primarily its advanced nuclear program. Netanyahu's comments in Warsaw carried added significance since they came a day before he travels to the former Nazi death camp of Auschwitz in southern Poland, where he is to inaugurate a new pavilion meant to educate visitors about the Holocaust and the Nazi Germany's quest to exterminate the Jewish people. Netanyahu and a team of five ministers met with their Polish counterparts and discussed security in Israel's neighborhood, including the stalled peace talks with the Palestinians, the conflict in Syria and a series of bilateral issues such as Poland's possible purchase of Israeli armaments. Israel has been urging Poland, as a member of the European Union, to declare the Lebanese guerrilla group Hezbollah a terrorist organization. During the press conference, Netanyahu contrasted the painful Jewish history of the past in Poland with the current strong relations between Poland and Israel. "The histories of our peoples are intertwined over thousands of years, in great achievement and also in great tragedy," Netanyahu, whose father was born in Warsaw, said. "We are both shaped by our past and we are both focusing together on shaping our future." Tusk concurred, saying "we speak a common language with Israel." The Germans carried out the Holocaust to a large extent in occupied Poland, because it had Europe's largest Jewish population and it was at the heart of a railway network that allowed the Nazis to easily transport Jews there from elsewhere in Europe. Many Israeli leaders are children of Holocaust survivors and Israel has the world's largest population of survivors. In recent years, Poland has become one of the friendliest states to Israel. Auschwitz remains the most vivid symbol of the cruelty of Nazi Germany's genocide of World War II. The world marks its International Holocaust Remembrance Day on Jan. 27, to coincide with the date of Auschwitz's liberation in 1945. The new exhibit Netanyahu will inaugurate will, for the first time, present Auschwitz in the larger context of the Nazis' systematic attempt to exterminate Europe's Jews. More than 1 million Jews died in Auschwitz and the adjacent Birkenau death camp in gas chambers or from starvation, disease and forced labor. Auschwitz-Birkenau was the most notorious of a system of death camps that Nazi Germany built and operated in Poland. Netanyahu also has an emotional connection to the Holocaust, or Shoah, although he has faced criticism for citing it frequently in the context of current events, notably regarding the potential nuclear threat from Iran. For years, Netanyahu has used his annual address on Israel's Holocaust Remembrance Day to caution about the danger of a nuclear Iran and vowing that "never again" will the Jews be powerless to defend themselves. "We will never forget the victims of the Holocaust, we will never forget the ultimate crime against humanity," he said Wednesday. "And we will never forget our obligation to prevent this from ever happening again." Adressing the mounting tensions along the border with Syria, Netanyahu said Israel is not taking sides in the civil war between, but reserves the right to act in case its national security is threatened. See all talkbacks "PM: Recognition of Jewish state not precondition for peace talks "